Produktinformationen "NISE 91 - Intel® Atom™ Prozessor - Intel® Platform Controller Hub- lüfterlos"
Equipped with Intel® Atom™ E640 1.0 GHz processor and Intel® Platform Controller Hub EG20T, the NISE 91 fanless computer features low power consumption of only 15W and an abundance of I/O options to meet the requirements of factory and industrial automation control. Featuring fanless design, the NISE 91 is able to offer optimum reliability and performance. 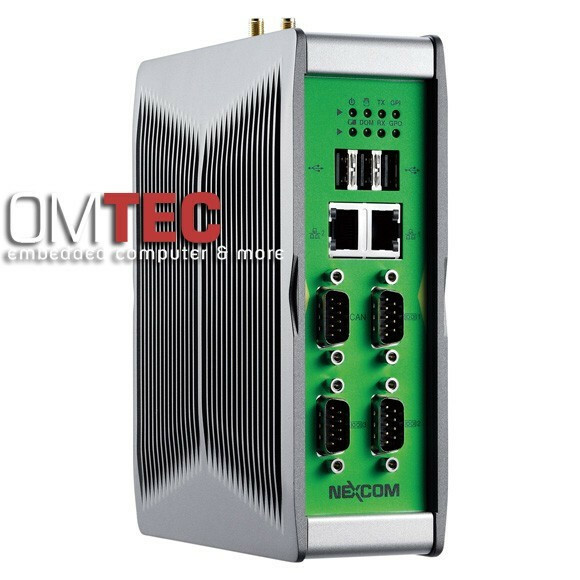 In addition, the NISE 91 is equipped with an abundance of I/O interfaces, such as 2x antennas, GPIO, CAN BUS, 3x COM ports, two Intel® GbE LAN and DC Input (either 12V or 24V DC) that provide flexibility for various application designs. Weiterführende Links zu "NISE 91 - Intel® Atom™ Prozessor - Intel® Platform Controller Hub- lüfterlos"